We Feel Fine is an art project that finds sentences from blogs and stitches together a real-time picture of how the web community is feeling. 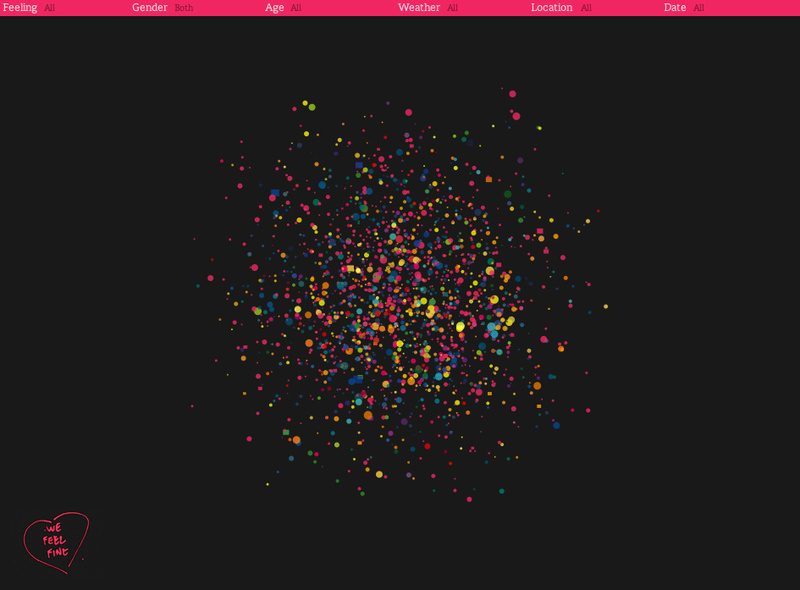 The default visualization uses a particle system to show the most recent thousand feelings. You can also build your own set based on criteria, such as gender, age, or location. Click the heart menu and go to Mobs to watch the particles organize in impressive ways. The gestalt of the visualization is compelling, but the details are the best part. Some sample montages. Also see a related project, Love Lines, which uses the same API. That's fantastic. Really. Thanks for posting it. insanely awesome, I love the spinkly little emotion balls bouncing about the place. not to mention the outrageously clever way of presenting misery. By the way, the first time I clicked I got: "I'm pretty sure I'm not an unfuckable troll, but I'll be damned if it doesn't feel that way most of the time." I really like it! What is that cute font they use for the blog quotes? This is fascinating! Thank you. That is really amazing. I'm so glad you posted it. Truly excellent. I could spend all day reading snippets. Am I the only one who just can't get this to load? Firefox and IE both fail.